But today, on this Thanksgiving Day... I reflect on Thanks Given, a "Thank You" note from Carson; a Thank You note he wrote after his high school graduation... his last correspondence to each of us. 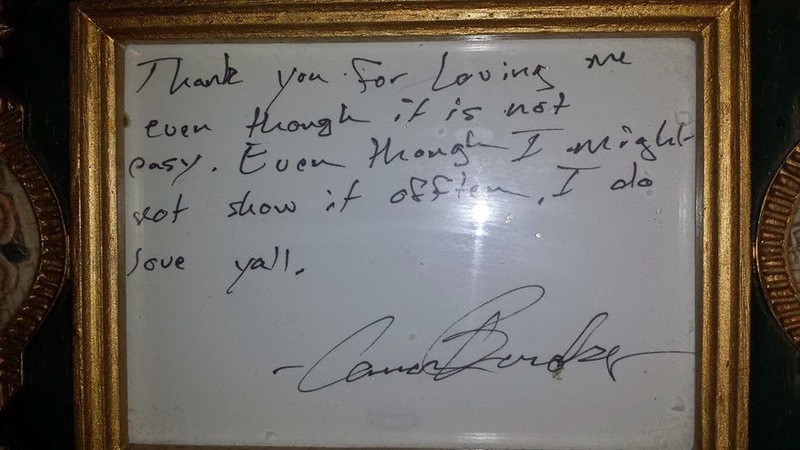 I have the Thank You note in a frame sitting on the breakfast bar where I can see it while I am in the kitchen. "Thank you for loving me even though it is not easy." You see, those who struggle with a Mental Illness often feel unlovable and worthless. They struggle to convey their feelings. A lot of times, their behavior (caused from brain chemical imbalance) is hard to understand because of their Mental Illness. I am thankful for Carson's Thank You note. I love to look at his unique handwriting. In it is a daily reminder for me to continue pushing through the walls of stigma and misunderstanding surrounding Mental Illness. With God's help and guidance, I will continue to spread words of encouragement and hope. Through education and awareness we can make a difference!